The University of Chicago tells its history through the lens of architecture from the first campus plan to the most recent contemporary tower. The university project design was created in order to provide a link to European style as well as the environment for the creation of a new model for higher education in the United States. Unilock paving was used for creating the landscape design and plan of the walkways and recreation areas for students. 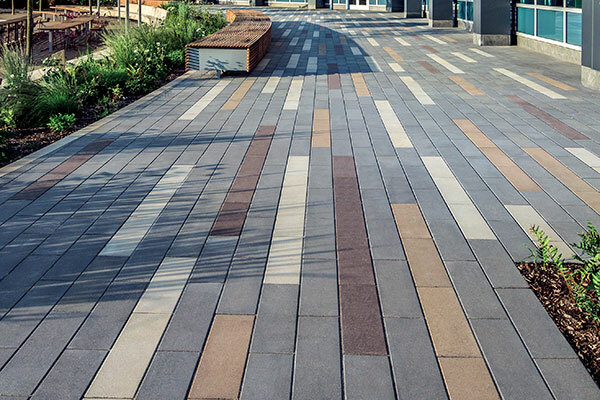 Umbriano® with Easy Clean™ Stain Resistance was chosen for the university walkways for its non-slip surface and stain resistant properties, durability in high traffic areas and its natural granite appearance. The unique mottled surface of the Summer Wheat color is accented with a rich Midnight Sky color that reflects beautifully with the historic site of the buildings. Promenade™ Plank pavers were chosen for paving the recreation areas giving a contemporary look and creating a gathering/social zone.